Why is this Morning Different From All Other Mornings? This morning I sat, coffee in hand, with my chair facing our back yard, and on all other mornings I sit with coffee in hand and my chair facing the television watching the news. I realize that when I have my back turned to the action, I miss the woodpecker pecking a hole in the closest of three hollow trees on the bluff. I wonder at his/her pecking and tried to count the number of pecks per minute. I lost count. 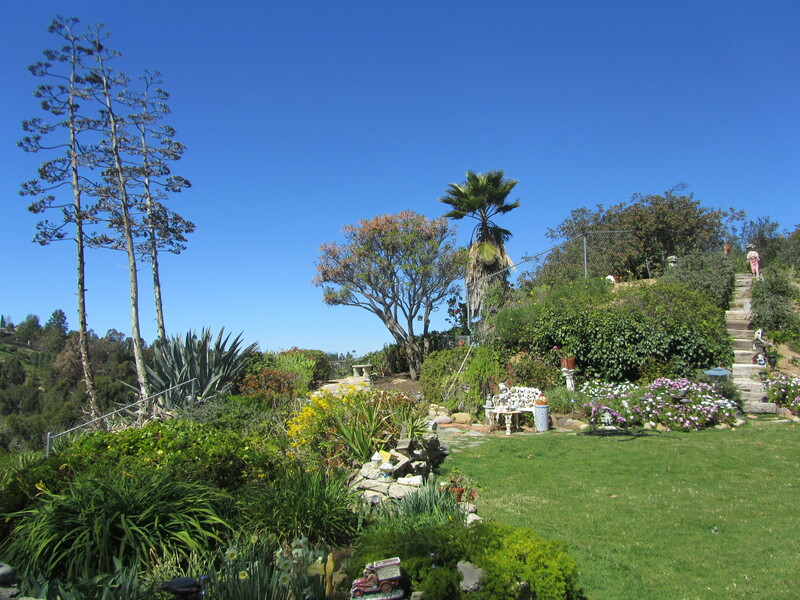 With my chair facing the yard and all of its inhabitants, I see the clarity of the bluff in the foothills of the Santa Monica mountains and further the Santa Suzana’s softly displaying the tiny snow cap of Oak Mountain Peak far in the distance. My objective this afternoon is to tell you of the wonders of this morning sitting in the turned chair looking into a seemingly empty landscape. There is a tiny snail inching along millimeter by millimeter leaving its gelatinous stain, the squirrel scampering across the patio is so energetic, the tiny bird is pecking at something nutritious on the newly swept concrete, the mating birds on the lawn leading to the hill are enjoying circling each other, and the sun kissed hill and all of its ground cover revealed nearly undistinguishable fluttering. When watched more closely, there revealed, were many and varied species of birds devouring the newly sprouted buds. Several pair of quail came strutting along the bluff line. I know what they are doing! They will have baby chicks to show us later in the spring. One year we counted twenty-eight quail, including chicks and parents. In order to gain an added entrance into this world, I opened the sliding glass door in front of my turned chair and was further entertained by sounds and smells of our backyard. Hearing the woodpecker loudly and clearly gave me the realization that this bird must have a special built in brain protection against concussions. This lovely scene must go on every morning and I think how I have missed all of it for years by just the turn of my chair. Certainly more often than not, you will find my chair turned, coffee in hand, because the real action is not coming from the inanimate box streaming the reality of others, it comes from my backyard, and yours. If you have a balcony, go out every day and see your reality. 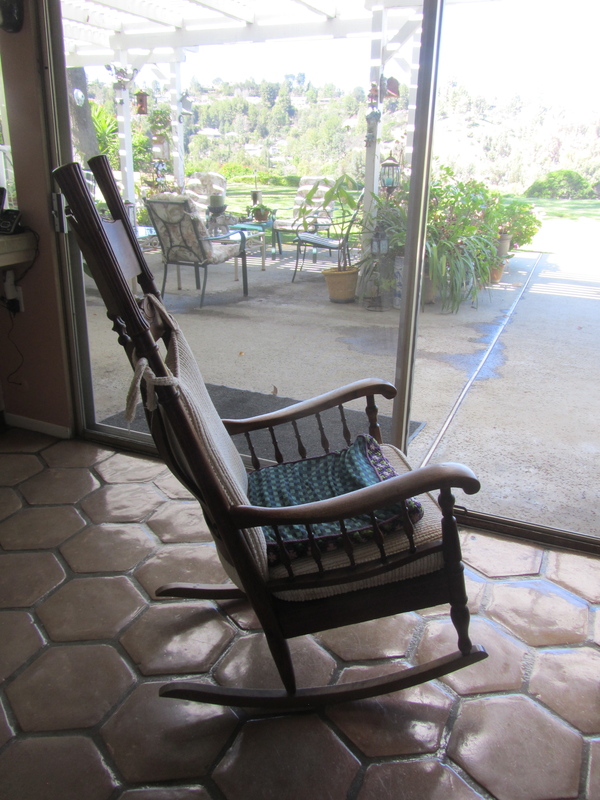 Just turn your chair in any new direction and report back what you see that you have heretofore, not seen. And my dear, you are LOVELY, LOVELY, LOVELY! Watching anything other than the TV is much healthier. I congratulate you on the discovery. Thank you for reading and commenting on my blog. I have since read yours and enjoyed your work very much. And I congratulate you on your excellent work with Reflections of your own. What a beautiful yard and what a beautiful post. You are absolutely right! Shame on all of us for looking at that infernal screen too often and not looking at that wonderful world out there that is right in front of us to see! Loved it! You are so right and so kind to post a comment. I thank you so much. You get me and that is so nice. after all we were brought up in the same town, breathed the same air and listen to the same teachers. Awesome! i can’t imagine looking anywhere other than out that window to that view. when the weather is warmer i will take my coffee out to my balcony and report on my view, which will be of traffic and skyscrapers, not woodpeckers and snails. but i will keep my eyes and mind open and i may see something unexpected. YOur traffic and skyscrapers are fantastical world around, just like my window and view. We should exchange houses for a week. oH wow. How is your decorating coming along/??? Skip plays a huge role in the yead looking so lovely. I thank him often. Thank you for reading. Doing the same thing. Keep turning your chair in all places where and when you are sitting. I keep turning mine. Hoping all is well. Thanks for reading.